I’ve been on a search for the best-performing and least-toxic or non-toxic cleaning products available, and I’ve finally compiled a list of my favorites here. I’m sure we’ve all read about the wonders of various concoctions of vinegar, baking soda, lemon juice and essential oils. And I’m not bashing those at all. I have used them myself for specific purposes such as cleaning silver or brass or getting a rust stain out of the bathroom tile. But on a day-to-day basis, I have neither time nor desire to mix up my own laundry liquid. Liquid Laundry Detergent: GreenShield Organic Free & Clear. I tried several before finding this one. I love it – unscented and it has a great dispenser which means you really do get 50 loads out of one container. Plus it has the best rating on EWG.org. Works very well in our new high-efficiency washing machine. Liquid Bleach: Not only is chlorine bleach terrible for your body and our planet, the smell alone is enough to trigger a terrible migraine for me. I avoid that by using Seventh Generation Free & Clear Non-Chlorine Liquid Bleach or Ecover Non-Chlorine Liquid Bleach. Both of these get an A from EWG and work very well too! I buy either one, depending on what’s available via Amazon Prime or in stock at Whole Foods. Dishwasher Tablets/Pods and Rinse Aid: Seventh Generation. Easy and my dishes are clean and streak free, thanks to Ecover Rinse Aid. The pods are new to me, but I’ve used this same rinse aid for years. Wood Polish: Eco-Me Wood Polish Cleaner. Sometimes hard to find but I really like this brand – one of the best ratings on EWG.org. Dish soap: Eco-Me Fragrance Free Dish Soap. I love that it’s fragrance-free. They also have Berry and Mint and Lemon scents. All Purpose Cleaners: Here I’m not really loyal to one particular brand. I like to mix it up and use different ones for different purposes. For kitchen countertops, I like Attitude All Purpose Cleaner or Earth Friendly Products Parsley Plus Cleaner which both have great ratings on EWG and cleans well with a fresh mild scent. When I need a stronger cleaner, I like Earth Friendly Products Orange Plus Cleaner. Beware – this will take the finish off your countertops if you have natural stone countertops! Glass Cleaner: My favorite glass cleaner is by Greenshield Organic because it comes in a mint version, which is one of the few scents that doesn’t trigger migraines for me. I also like Attitude Window & Mirror Cleaner. It has an A rating and works well, although personally I have not really struggled with finding good non-toxic glass cleaners – not a huge difference to me. Attitude makes theirs in different scents like lavender or citrus zest, and for me, fragrance-free. Hand Soap: Dr. Bronner’s Organic Shikakai Hand Soap. I like that this soap doesn’t dry out your skin. With lots of DIY going on in my house, plus taking care of human and furry little ones, I wash my hands a zillion times a day. It’s nice to keep some layers of skin on my hands. I like the Spearmint/Peppermint version. I also use the Dr. Bronner’s Pure Castile Soap (again in Peppermint) – you can read about the difference here, but basically, the Shikakai or sugar soaps are more moisturizing due to the addition of Organic White Grape Juice, Organic Sucrose, and Organic Shikakai Powder. Hand Sanitizer & Wipes: EO Hand Sanitizer. I use this essential-oil based hand sanitizer instead of the chemical-laden mainstream brands. I like Peppermint, but they also offer Lavender or Sweet Orange. It comes in a spray or a gel and you can buy tiny sizes for your handbag or larger sizes to use at home. We tend to be a soap & water family at home but I like to have this for cleaning on the go. 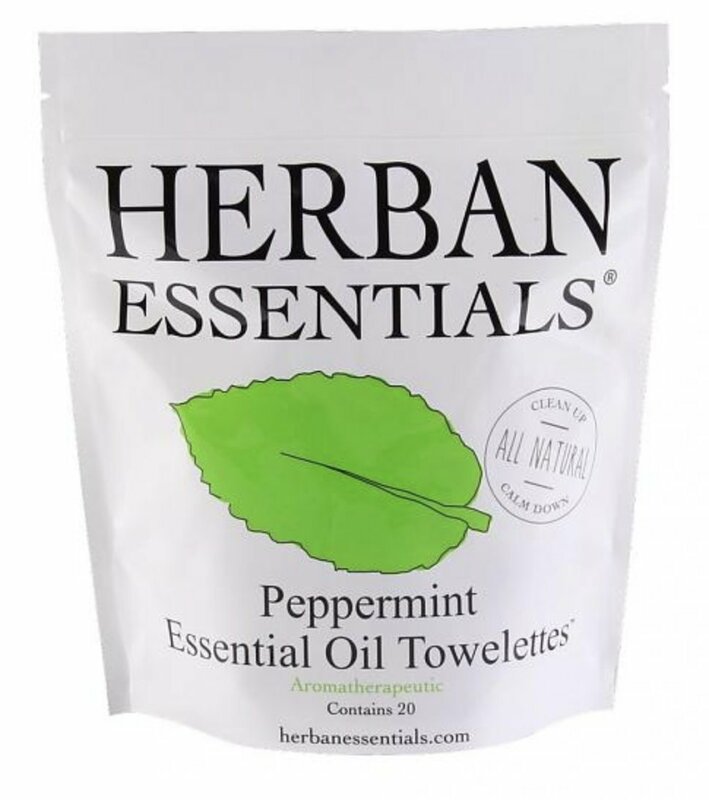 I also carry these Herban Essentials Peppermint Towelettes in my bag at all times. They are a great all-natural alternative to regular wet wipes – for wiping hands, airplane seats, shopping carts and more. I use these interchangeably with Giovanni Recharge Organic Peppermint Towelettes. I just choose whichever one is available on Amazon Subscribe & Save for the 15% discount. Natural Moth Deterrent: So technically moth deterrents aren’t really cleaning products, but I had a problem with them a few months ago and thought it was worth pointing out that standard mothballs contain naphthalene which is toxic, carcinogenic and highly flammable. Those have been banned in Europe since 2008. WHY are they still sold in the USA? I bought these Organic Lavender Sachets and this CedarFresh 71 piece Cedar Value Pack and haven’t had any problems with moths since. I hope this list is helpful for those of you who are on the hunt for safer non-toxic cleaning products. Do you have any favorites that I haven’t mentioned? Leave a comment below. For more recommendations for safe products for personal care, kids & home, please check out my Shop.